Now, a while back some of you may remember that I did a review on Argo Teas Sangria, which was a readymade iced tea of Argo Tea. Which as you guys know, I was forced to give a bad review on the tea, as there was not really anything nice to say about the tea. Well, they not only sent me that tea, but they also sent me a Loose Leaf tea to review as well. And I guess after what happened, they never asked me where my review was. But, if a company sends me something to review, I have to review it. Why? Because whether or not I like the product, it wasn’t sent to me to play with. It was meant to be poked, prodded, and pushed to the edge! And boy do I have some things to tell you about this tea. But the question is, can Argo Tea redeem itself with this loose leaf tea review? 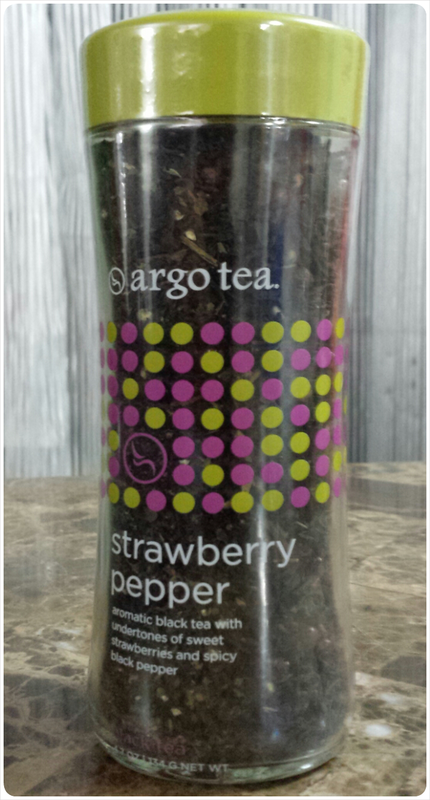 Argo Tea’s Strawberry Pepper Tea is definitely a unique flavor. And can be rather difficult to understand. The idea of pepper in a tea is both odd and foreign to me personally. (Besides pepper corn, which may or may not be kind of similar). And you will need to have an open mind to it as well because it may put you if when you hear the word “pepper”. But enough of my ramblings about “pepper acceptance” and on with my review. Argo’s Tea Strawberry Pepper Tea has some very nice subtle and fruity notes that complement the savory pepper taste of the tea. It’s a bit almost menthol like because of the pepper. But nothing serious. It’s similar to an actor or a narrator reading a story, pausing for dramatic effect. Oh the suspense! The pepper in the tea is that something in the tea that makes you think, “Wow, that’s different.”, or “What is that?” I really like when a tea makes you want to sit down and think. I think that this will probably be the one of the most interesting tea’s you will encounter. As for freshness, I am not a huge fan of the packaging as I do believe and have come to find through trial and error, that glass is not the best thing to store tea in. Especially if you plan on having your tea out where there is any type of light around. It can alter the taste of the tea and might make it taste stale. Or if it doesn’t do that, you might lose the smell of the tea altogether. But if you keep the tea in a dark spot, away from light, you should be fine. However, the tea is fresh and I a definitely appreciate it. Think this tea is worth giving it a try. *NOTE: There was no direct link to the tea on the website, so you may have to contact them about purchasing the tea if you are interested. This product was given to me courtesy of Argo Tea for testing/reviewing purposes only. This is NOT a paid review.